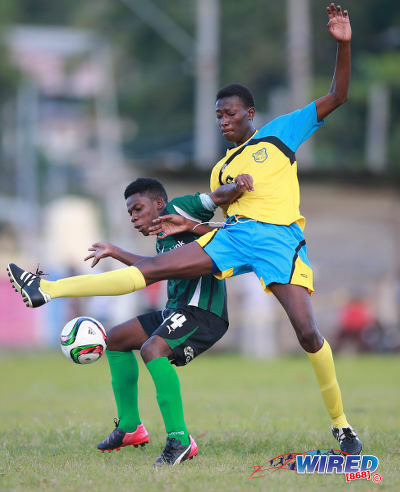 Eighteen year old Naparima College student Shane Sandy, who has eight CXC passes and is currently pursuing his A’ Level qualifications, hopes to eventually attain a degree in Sports Management. 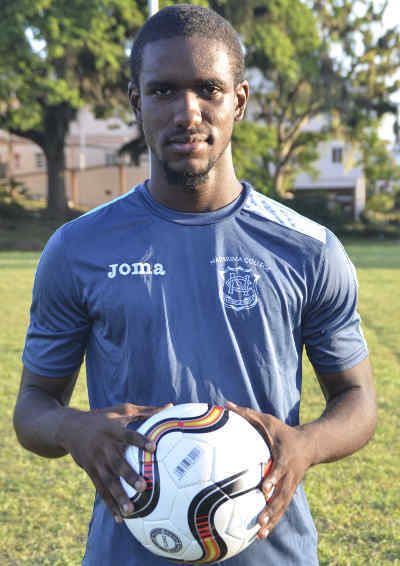 But it is the Tobago-born footballer’s management of the Naparima midfield that has caught the eye over the past two Secondary Schools Football League (SSFL) seasons. 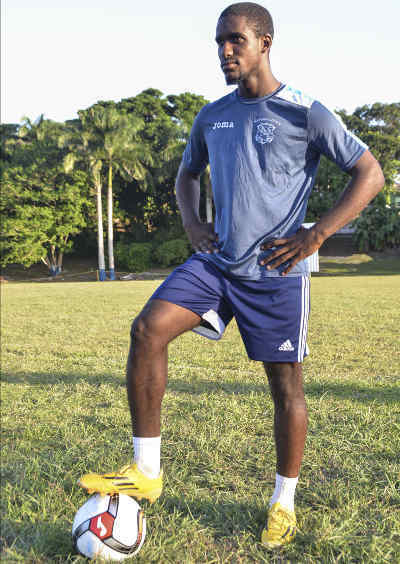 Photo: Naparima’s midfielder Shane Sandy. Sandy left the comfort of Tobago, his parents and his beloved Lambeau FC in one of the toughest decisions of his life so far to pursue new horizons in Trinidad. He was drafted to Naparima in 2015. 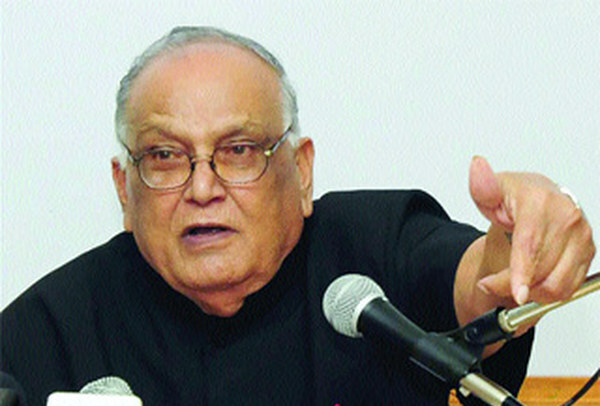 Sandy lauds the institution’s sporting and educational prowess and is determined to make it work for him. Sandy sees the sport as an opportunity to improve the life of his family and expressed his appreciation for their unwavering support for his education and craft. He suggests that opportunities for Tobago footballers are limited and feels more media exposure at the schoolboy level will help. 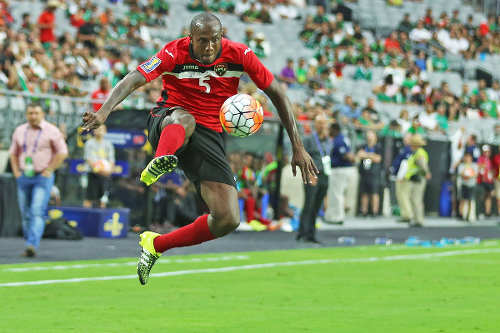 Sandy thinks the ultimate achievement as a footballer is to represent Trinidad and Tobago at a World Cup and he hopes to emulate the likes of Dwight Yorke, Russell Latapy and Shaka Hislop at international level. 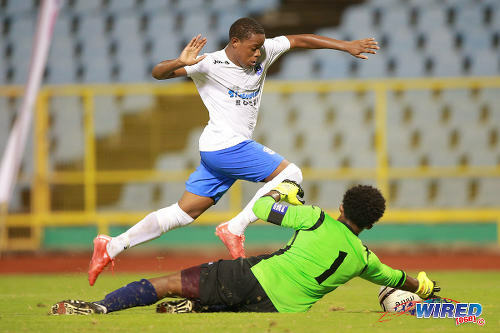 Photo: Naparima College player Shane Sandy. I am more of a quiet person. Sometimes I will be laughing and rowdy but most times I am quiet and reserved. Now and again, I make jokes with the players, school teachers, everyone. But when it’s time to be serious I am. I am in love with Dumplings. Dumplings and Stewed Chicken and Mauby. (He grinned). Home relaxing, watching TV, liming. When I’m in Trinidad at my sister’s: just talking. When I am in Tobago: just liming with my mother, talking all kind of things with my father and relaxing with my friends and cousins. FC Barcelona, the one and only. Some people would say (Lionel) Messi, he is the greatest player in the world. (But) I am a midfielder so I look at the midfield. Xavi was my role model but since he is gone I am looking at (Andres) Iniesta. My parents really push me. My sister Crystal Forgenie also, but the type of motivation my mother (Bernadine Estrada-Sandy), put into me really pushes me to organize myself in football. My father (Theodore Sandy) also pushes me in academics and football. Does your family come to your games? Once mom is in Trinidad, she comes (and) my dad also… My sister and brother in law (Quinton Forgenie) come to every game whether it’s San Fernando, Port of Spain, Arima or Central. I started in standard five. We had a school football league and from there that was it. They made a little club and we joined, me and my friends, and it was on. I ended up going to El Dorado East Secondary. There I met some real players that I really admire to this day still (including Daneil) “Danny” Cyrus, my cousin. (Cyrus) was really inspirational to me. Shaquille Smith, Shaquille Bertrand and Marlon Mohammed were my role models in football. When I went to Signal Hill Secondary my role model was “Paco”. (He can’t remember Paco’s formal name). My earliest memory was scoring a corner against my friend Nathan Fergus in the Primary School League. My best memory was in Form one, playing for El Dorado East in a game against San Juan North Secondary and I scored a (goal from) half line. Who is your most influential coach and why? 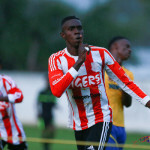 Curtis Moses from Lambeau FC in Tobago. He was the one that showed me my real talent. He showed me who I am, where I was and where I could go and all the improvement that I needed to make mentally and physically. I believe my mindset towards the game as in how important it is for me to make a future for myself in the game. I don’t play too much and laugh around too much (on the field). So my mind set sets me apart. (I’m) laughing from school down to training (but) as soon as I change my clothes and get ready to warm up, I switch. I always say my dream is to play alongside Messi before he retires. So that is how far I am willing to push myself. That’s really my goal, to play alongside Messi with FC Barcelona. What is your personal target this season? My personal target this season is to score more than ten goals. Right now I am on one, sad to say, but I want to score at least ten. What direction do your parents want you to go? My father played football in his days in Tobago (with a team called Dazzlers) so he understands the passion and the love. So it’s like my mom pushes me more in the academics and my dad pushes me more in the football, so I have it balanced. How do you manage academics and football? Thank God for my family and friends. I must say they give me an extra boost. The reason I don’t want to play with any Pro League team is when football finishes in November, from then to May/June, I will be studying. I won’t be distracted by any Pro League training or games. My mind will be books, school, books, and school. The time I’m losing out now, I will be losing again next year and then it’s me to cry when exam time comes. I just came into lower six so I’m doing great. I am settled in and trying to balance it. Teachers are helping and working with me (to make up for) what I am losing out (during training), when other kids are home studying. I asked (teachers) to help me with extra classes. How far are you willing to go academically? I must get a degree really before I put down my academics… In life now, five passes not really saying anything. I have eight passes and still going on to do Cape. After I get my degree, then anything with football. I want to do Sports Management, that’s the degree everybody is doing now. Once you’re a sports personality and you’re into academics most likely they will push you in Sports Management. So I am on that and also a business degree. 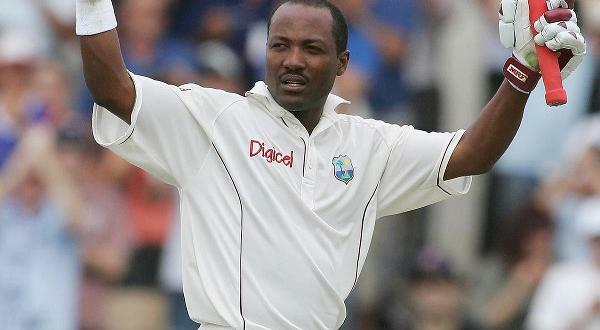 Who do you think are Naparima College’s biggest rivals? Well I knew it was Presentation College, San Fernando. Every time we play them it’s a big crowd. Every time, no matter what! There is also a rivalry between Naparima and St Benedict’s (which gets a) big crowd. CIC pulls a big crowd and St Anthony’s… as well. Do you see football as a solid career choice? Yes and no. If you depend on football, God forbid, your foot breaks (like) for example (Luke) Shaw from Manchester United. So you need the academics. Jump high or jump low you need the academics. Each footballer should have a Plan B. What is the next step for you in football? To get a scholarship. Hopefully I play well enough and do satisfactory, good, great or excellent in my academics, so I will be able to win a scholarship from Naparima College and move forward. Hopefully to the USA where I can get drafted to the MLS, show my talent in the MLS and from there move to England or Italy. 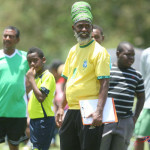 What do you think is needed to elevate Tobago football? Wired868 came to Naparima College, talking to me, so who is going to Tobago? Speyside in the Premier League now, they’re not doing that good but still, at least you can say there is good talent in Tobago… Speyside is one school, so what about Scarborough secondary, Signal Hill secondary, Goodwood, Roxborough, Pentecostal Light and Life. These other schools need recognition. 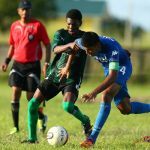 Photo: Carapichaima East Secondary’s Micah Serrette (left) tries to keep the ball from Speyside High School’s Elder Kamarie during SSFL action today in Speyside, Tobago. What would success mean for you in football? Making a World Cup for Trinidad and Tobago. I must say seeing Dwight Yorke, Latapy, Stern John, Dennis Lawrence, my boss Shaka Hislop (play at the 2006 World Cup really inspired me). Making a World Cup for my country for me will be a great success. That is from August to November. The spring is similar but less games. More emphasis on training and strength and conditioning. That’s obviously the major issue, the ncaa is trying to change it to a year long season. Okay. Because that is only four months whereas players in professional leagues are active for at least 10 months. Sometimes they get only two weeks off if they are international stars. Prince Borde that Division One schedule you mentioned is from what month to what month? Hard work and dedication is awesome, confidence mental toughness. I think more importantly you need good fortune to be successful. I call it Gods favor. Injury free, and knowing the right people. Some call it luck. Some say your hard work place you in these situation. I think to make it to the top of anything is extremely hard but the odds of success in sport is sometimes more difficult. Essentially we all agree the same thing in that football is so competitive thst if you are not a very top prospect it is difficult to make it. Prince.. I agree.. By age 16/17 you can tell if a player has a good chance to be at a high level.. Though many don’t fully develop until a bit later.. Kid you not.. To make it to the top end is not easy.. It’s total dedication..
Here’s a day in division 1 soccer. There is always talk of a plan B. Does a doctor have a plan b for if he lose his licence, does a nurse have a plan b for if she lose her pin? Football is a profession not a hobby. It is an extremely hard profession to obtain success.. You have to live the game and be completely dedicated.. The poor boy from Brazil, Argentina, Italy, Nigeria, Ghana, Uruguay etc will be working like a lion to succeed.. You can’t do this professional footballer thing halfway.. He is honest. Every footballer should have a plan B in the grand scheme of things. I admire some players that go for broke and put it all on the line, but i respect those that realize having an education is a win win situation. Interesting interview.. He appears to be quite focused. There is always the argument about being a successful footballer and obtaining a degree.. I have my opinion on that.. Which is at some stage he may have to choose one.. Football is work.. A job that requires serious serious dedication to get to a high level. Unless you’ve played at a high level you wouldn’t understand the work ethic, dedication and discipline required to get to the top level. Football today is a different kettle of fish. It’s really really difficult successfully doing both.. It’s possible though.. Good luck to him. Is a either school or pro. One road or the other. If one is good enough, have the ambition, drive and discipline, go for the PRO!!!! It’s one in a lifetime opportunity. Kenwyne Jone and Marvin Andrews are excellent examples of less talented turned professional players!!!! Marvin, Dog, had hard, ambition and the will to make it. That’s all it takes plus a degree of luck. But if one wants to go to school, that’s fine. Is a choice!! But both don’t meesh. 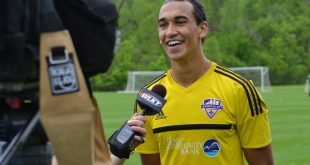 After 4 yrs of college ball in the US, one will be behind in the level to be a professional. Whilst one is spending a whole 4 yrs playing collegiate football, from ages 18 to 23 approximately, guyz that same age are playing professional already, in starting 11’s, etc. The gap wouldn’t be attainable!! Professional footballers train, play and compete at a high level 6 days per wk!!! How is one gonna bridge the 4 yr gap playing amateur football at age 18 to 23 approx and or after!!! Under 1% chance to be a professional then…. Lol. Nah. I think you have a slighter better shot if you don’t go to college. Clubs are willing to have a look when you are under 23 with a CV that includes a national youth or senior team. But hard to get in the door when you are over 23. My point is Lasana Liburd the percentages are so small, is it worth the risk? KJ, Yorke, Latas all got their break early. Once you past 18-20, you’re done… you almost have to be a prodigy to get that major European deal. Selling these kids on that dream almost amounts to financial suicide…. Europe is for that rare talent….one man’s opinion. I would have to agree. To make it as a pro, you need that rare talent or a lack of viable options to make a good living, which means you compensate with bad mind. And as for the players without the academics who still want to play school football until they are knocking on 20… Sigh. Brent Sam needs a guidance counsellor. Hope Brent Sam gets his academics and allyuh could take him too Brent Bennett. The boy can really play. But I’m just not sure if his path is going to lead him to a proper pro career. He will probably end up like the abundance of talented players that turned out to be nothing…. make a Lil money in the “pro league” and then flame out..
No academics = no scholarship…..
Doesn’t the MLS draft college players? I think the MLS now pulls out the top kids early and doesn’t draft as many players Kendall Tull. But the US boys would know more about that Project whatever it’s called. Correct Brent. And remember you may be taking up an international slot. So you have to be quality. This is just an example as to how difficult it is to go pro though eh? Consider Kenwyne Jones had decent enough academics and would surely have had scholarship options once. At least you have to appreciate the odds he beat to get where he is today. Nope. 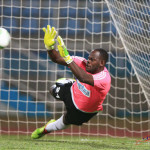 Shaka is a goalkeeper and they mature later and that was a totally different era. Yohance did it if you are talking about the second tier leagues. But education is definitely the safe bet. So I agree that it is a smart decision. You’re right Brent Bennett. Darryl was in the Dutch top flight. He might be the exception in truth. Sad that he never really got a chance to break into one of the marquee leagues after. But that is a solid accomplishment. And Darryl played for T&T right after the blacklist. 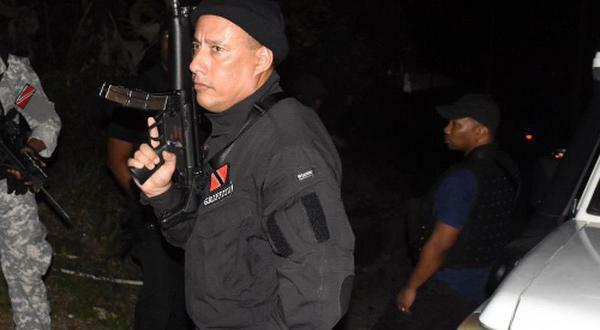 So he was around at the worst possible time to be a T&T footballer. Yohance Marshall didn’t play in Europe? No Yohance was in Thailand or something. Central FC actually put him back on the map. On the flip side, it is exceedingly difficult to make it to Europe after collegiate football. Or even to get back on the international stage. There are loads of examples of that. I really like him as a player too. He has the potential to go box to box and is mobile, strong and makes good decisions. ..Spot on Lasana. The only place he would probably be able to go pro would be in MLS or one of the lesser US leagues. Or in some obscure league with an even more obscure club. Still, Gopaul got his own luck and who knows what awaits the boy. Local schools have been drafting players for decades actually Chabeth. And of course foreign schools do as well. I’m willing to bet that Pappy and the gang didn’t pass for Shiva Boys Hindu College at the SEA exams either. Lol. That’s intense. Would be interesting to know what other sports this happens for. But to the best of my knowledge all my friends who played in the SSFL back in the day, all passed for the schools they went to. Not my era. I remember QRC imported a whole team from the junior secs during those days. Walter Alibey, Jeremy Shortt, Eusebe, Chaim Mckain, Marlon Springer… It has happened long before then too. CIC had Hisham Gomes and Lyndon Andrews and Rodney Granado who didn’t pass for the school although two of those came from Holy Cross. Some schools insist on a certain academic standard. Others are more loose. Hmm… that just is crazy. To be switching schools just to play football. That seems to be taking it a little too seriously. It’s no wonder then that you can have adults telling kids to ignore referee’s instructions. Keep in mind that most of those kids he listed eventually got scholarships. Perhaps had they stayed where they were it may not have worked out. Just saying! I agree Brent Bennett some time you have to follow the opportunities. Chabeth Haynesfootball is a serious sport that provides income for thousands of people. Some see it as their way out of a bad situation and some see it as a way to feed their family. It is badly abused though and should be banned. I have seen instances where the ‘students’ don’t attend classes and amount to nothing thereafter. Don’t need any lectures on the value of sport. I work in sport and have been a national team staff member for the last five years. And kids in other sports go to the schools that they have passed for and go on to get scholarships. Not to mention, I went to college in the States and played sports. And for 6th form French and Spanish orals my topic of choice was “the value of sport to society.” and I got distinctions. So i had to have made some good points. 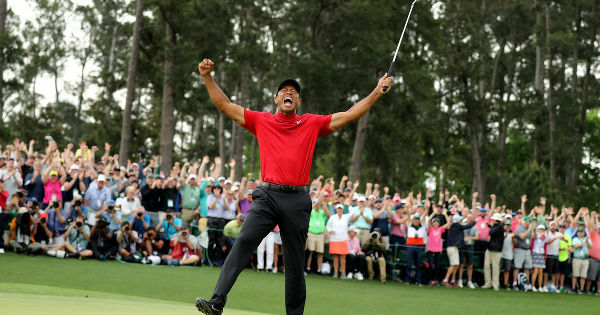 So again, i need no lectures on the value of sport. And all sports are serious. Not just football. But whatever I guess. Lol. Easy bro nobody is lecturing you. Sometimes just being in a better academic environment can help a player. I know two players who did get scholarships despite being in schools that didn’t play in the SSFL top flight. Kelvin Jack and Ainsley Nate Noel. Ainsley was damn good too eh. So it really can happen either way and you can get a scholarship without changing schools. But then Ainsley was at Tunapuna Sec and Kelvin was at Holy Cross which suggests that they always had decent academics. I don’t know what QRC’s entrance exams for those boys looked like. But it is a very good point that most of those players went on to get degrees. I think they are exceptions to the rule Lasana. Yeah. For sure Kendall Tull. Fatima had a player during my time who they found out couldn’t read and write properly. 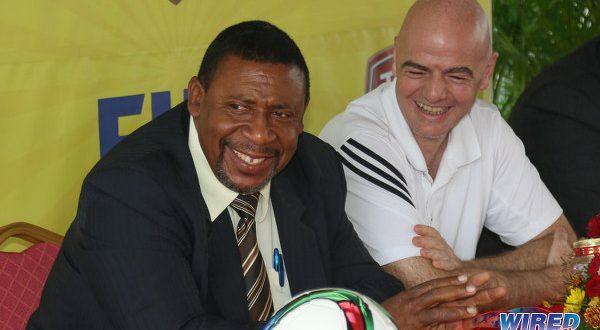 But, as far as the SSFL is concerned, once you can get a transfer they cannot discriminate against you. So the Ministry of Education are the culpable ones. I know I’m older but anybody ever set foot in a Comprehensive school vs a 5 year school of yesteryear? Massive difference. Most students did not care much about their academics at the Comprehensive schools whereas it was inverted at the 5 year schools. I know, I’ve been to both. I’ve been to both too. It is so easy to get lost in the system at a comprehensive because there are hundreds of students in each form. And I always remember end of term in CIC when everyone’s grades go up on the notice board. You really don’t want to be anywhere near the foot of the class. Nothing motivated me more than knowing I would have to stand next to my friends at the end of the term and watch for my name on that notice board! Don’t know if I told you Brent Bennett. But it was because of Joel Nesbitt that I went to do A’s in Arima. I lived walking distance from the school and Joel was like my big cousin since I was about 10. He went from Holy Cross to Arima and got a schol. So I wanted to do the same. Hey Brent… If nothing else, can we agree on the fact tht I’m female. So maybe you can say easy girlie or something instead of bro? Thanks! ? Lasana Liburd if it wasn’t for Coach Grayson, Joel and I wouldn’t be where we are in life today. But had I gone to a Jr Sec prior to going to Arima not sure I would have been as successful. So many negative influences not to mention the quality of teaching is different. Although my accounting teaching was probably one of the best teachers I’ve had in my life. Imagine when I went to Arima to repeat the principal told me personally he didn’t want me in specific classes because I’d be a distraction to the females in the class? Went to a math class and the teacher said on the first day “all who want to learn come up front and those that don’t go in the back” . To my dismay people actually got up and went to the back of the class. Unbelievable…. My most vivid memory Brent was when the VP (Batson) called students to stop to inspect them or whatever, they might run and he would chase them! That could never happen in CIC when people knew everyone in their form and so on. Great exercise! Lol. I actually felt Compre had better teachers in some subjects but seen what you mean with students. But Keith Look Loy, he will have a hard time going pro after collegiate football, won’t he? And I understand NCAA Div 1 isn’t what it used to be now that US Soccer has yanked its top teenagers out of the league. As usual clear and concise interviews with a good balance of both personal and professional. Videos are evolving always a pleasure viewing them they give a personal touch and added bonus as opposed to plain black on white written interviews, you’re actually getting to see and hear the interviewee. This particular interview was inspiring to read and hear this young man speak, his grounded, humble and well balanced demeanor is one that should be highlighted. Schools draft kids to play in the SSFL? Does this happen for other sports? I’m a very competitive person but between drafting kids, firing coaches after 3 weeks, and matches descending into such anarchy that they can’t be completed, this league seems to be a little too heavy for it’s own good. Lol. All the best to the kid though! For any college scouts and coaches… You would be lucky to get this boy. I’ve seen him play and he has huge potential.